Will it be possible to apply for the VRO post directly? I was unable to upload the application for the post of VRO, after paying the fee. Will it be possible to apply directly in any concern office? Eligibility criteria for VRO? Am i eligible for VRO post after completing diploma in polytechnic? Can I apply for the post of VRO after completing diploma? Details about VRO post and how to apply for VRO post? What is the age limit of physically handicapped person for VRO post? Details regarding VRO post and how to apply for them? How to apply for VRO post in Andhra Pradesh?From where to get this form? What is the eligibility criteria for VRO post? From where to get the application form for VRO post? Re: Will it be possible to apply for the VRO post directly? You said ,You couldn't upload your application. I think so many members have this problem. Maximum number of Candidates do the mistake at Photographs and there signatures. You should past your photo on white paper and sign below and scan only part of pass port size photo and Signature only don't scan entire white page. you have to check your image not more than 50 kb. If the all the above details given by you proper way.You can very easy to submit your photo graph. You can also submit your application from any one of the following centers with the additional pay of Rupees 20/- only. 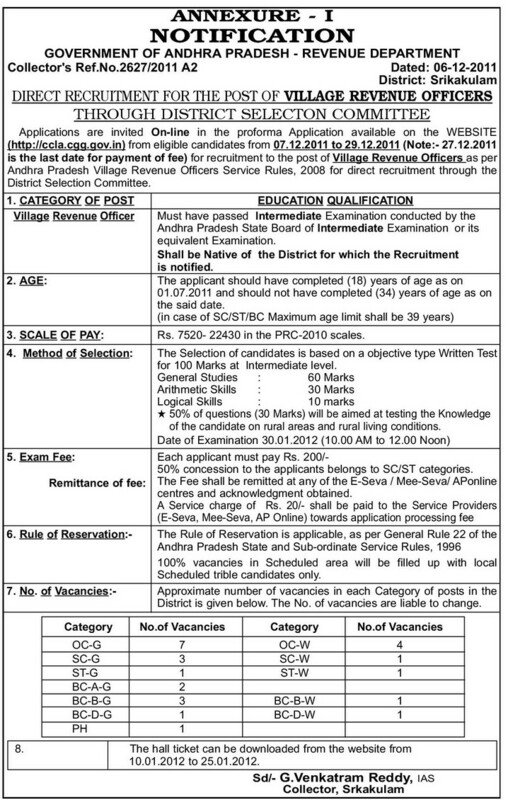 Village revenue officer exam will be conducted on january 30 2012.for applying to this post each applicant should pay an amount of rs 200 in cash at any of the e-seva /mee-seva/ap online centres.we have to pay a service charge of rs20 to them.Then we will be given journal number which we have to use it later.We have to fill online application on the website (http://ccla.cgg.gov.in) between december 7 2011 and december 29 2011.Last date for paying fees is december 27th. you can download your hall tickets from january 10 2012 till january 25 2012. No,you cannot apply directly at any concern office. you cannot apply for the post of VRO directly in any concerned offices. you can apply only online through www.ccla.cgg.gov.in. as you have already submitted the application fee than visit the above mentioned website for submitting online application form. the notification for the given post has already been published and the candidates can apply online between 07-12-2011 to 27-12-2011. YOU SHOULD BE AN INTERMEDIATE FROM AP BOARD OR EQUIVALENT. YOUR AGE SHOULD BE BETWEEN 18-39 YEARS. THEIR WILL BE RELAXATION OF 5 YEARS FOR THE CANDIDATES BELONGING TO SC/ST/OBC. THE SELECTION OF THE CANDIDATES WILL BE DONE ON THE BASIS OF WRITTEN TEST. 1)For vro you should have completed your 10+2 i:e intermediate. 2)Your age must be between 18-39 years. 3)There will be age relaxation for sc/st/Bc for 5 years. > Issue of call letters / hall tickets in the ratio of 1:3: 5-20th January 2012. > Completion of recruitment and posting: 24th February 2012. 1.First you should pay application fees of 200 rupees in any eseva or meeseva centers. 2.Then you will get journal number. 3.Then apply online by giving journal number in it. Use the BLACK PEN only; for signature..
Well sorry to say but you can not send your application form directly to the VRO address.The VRO/VRA application form can be filled through online only.There is no option for offline filling of the application form . Then do not worry its not a major problem .It happens may be because your connection is to slow or your photo or signature is not in proper format . After this you can easily upload the photos of yours and you can send form online . then you will get the Acknowledgement card with journal number mentioned note it down for future . The application form is of rs 200 for general students and 100 rs for the SC/ST. Will it cause any problem if I submit my VRO application form online without my signature on the photograph? When Application for Sub Inspector post is scheduled? When are VRO post application forms going to be released? All times are GMT +5.5. The time now is 10:12 PM.